Nintendo and Sony have begun to put browsers into their videogame consoles and handhelds. It is interesting to see this trend because I happened to work at Spyglass, you know... the Mosaic folks, at a time when they had to fundamentally shift their market or disappear. We shifted to a strategy of supporting embedded devices. One of the customers at that time of our code was Datel who just so happened to port the code to the N64. That was circa 1999 or so... flash forward and what is old is new again. To celebrate that time though and the concept of embedding browsers in devices I'd like to talk about another port (one we actually participated in unlike the N64 work) that we did and why it was very, very cool for the time. The IBM Network Station network computer. Network computers were going to be the next big thing. Client-server computing taken to the extreme these NCs were going to allow everybody in a corporation to have a computer on their desk. These NCs would run simple applications on their own but also provide green screen emulation, X capabilities for running applicaitons off UNIX servers and a Java JVM that would allow various applications to be pushed down and executed. They didn't take over the world but several shipped and had a modicum of success. 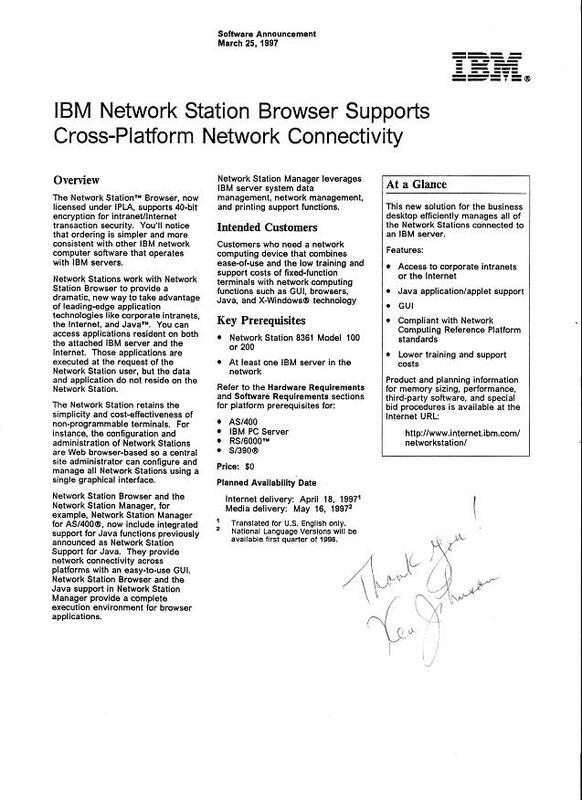 Our involvement with the IBM Network Station began when Spyglass was approached to see if we could get the browser running on their hardware. I'm convinced at this time that the approach was a bargaining tactic by IBM with Netscape, errr.... Navio and their browser. The challenge they laid in front of us was to have a functioning port of the browser in a week or two's time. Now this was in the days prior to our Device Mosaic strategy. The only viable codebases we had were our Windows and Unix ones. The code at the time had many, many issues with memory leaks and crashes and getting to fit on an 8MB NC was sure going to be a challenge. There were two of us on the team George and myself. We were both founding members of the professional services group at Spyglass and were assigned the task of getting this done. Brief background on why a port: The NC was managed remotely. To accomplish this IBM felt that a browser based interface needed to be made available. Therefore a browser that ran on the device itself to allow a user to browse to the appropriate pages on the server and configure the browser was required. It would also allow people within the company to run several compute intesive tasks without utilzing a server CPU like Citrix but rather all locally. History complete it became immediately apparent that our Unix codebase would make the best starting point. Why? Well because it turned out that the IBM NC was really nothing more than a gussied up NCD X terminal and the X terminal ran a variant of BSD. The problems started arising when we got the build environment and found that there were no function definitions in the header files. This caused the build to spew thousands of warnings without any real clue as to what could cause or lead to real errors vs. a function simply not being defined. Finding a real problem in this output was an exteremely tedious process. Within the span of a couple of days though the makefiles and code had been tweaked and we got it to compile. Running the app was another matter. The kernel the NC ran was optiimized for memory. As such it did include all the functions you would expect in either the C runtime or within Xlib, Xt, or Xm. It included the ones that NCD had previously used and found useful in their apps but that was missing a number of functions that a browser needed to rely on. After getting a couple spins of the kernel we finally had an executable that would run and a kernel that could provide the appropriate services. We were absolutely delighted to watch our browser start up and run on such a low end device. It couldn't do much at the time but it provided enough ammunition for IBM, which had a hard requirement to ship an 8MB system with browser, to oust Navio as the default browser and install the Spyglass browser instead! We divided up the work and brought on many more engineers from around the company. The two of us got it sold but now we needed to mobilize the entire company to deliver such a comprehensive solution. We acquired the source to Microsoft JScript, hey there is something useful in dealing with MS at the time, and one person took responsibility to create a COM interface for our browser code to access the JScript engine. We had folks working on exposing the DOM required to support the IBM application. It all culimated in a team of engineers from PS and core descending on our headquarters for Mosaic development in Champaign for a final march to get everything done and integrated. It ended after two 90 hour weeks with most things integrated and functioning to a point where we could again seperate and wrap up the rest of the work back at our respective home bases. There were several notable memories of that march but several leap out as being more memorable than others. Fighting with a bug in the compiler for the NC because it misgenerated code for passing certain types of structures by reference. This was only found by finding the address of the code module that was where we died (debugger was woefully inadequate for this) and then reading assembly code produced by the compiler to see what was happening. Listening to streaming internet radio. I bought my first CDs because of listening to them for hours on end while coding (take that RIAA). I bought Tangerine Dream: The Dream Mixes and the Mortal Kombat soundtrack because of that time. Playing ping-pong and pool after midnight in the back room/garage trying to stay awake and clear my head to think a little more clearly. Threating to quit if the march didn't end as the hard goals that required being together had been accomplished and everything else would better be handled at home. In the end the IBM NC shipped with 8 MB "standard" and our browser as the default browser though Navio browser was available with larger memory configs. A 16 MB version was required to run Java applications and have Java integrated with the browser (through a custom shared memory interface). We integrated JScript with our browser and had enough of a DOM done to accomplish many many cool things. We started the process of really profiling our code to both improve performance and reduce memory consumption and we added a substantial amount of stability in low-memory conditions. These changes helped set the foundation for when our transition to a device oriented low-footprint browser took place. All that for what, as I described earlier, was an initial 3 or 4 days of work to get the business! There are many, many interesting Spyglass stories to tell. Working on a STB browser with VOD functionality built-in. Working on a remote browser for interactive TV applications and hotels. Creating a proof-of-concept of a remote Java application server. Designing a next generation browser (DM 4.0) that could run on a device and offer the capabilities of the, then new, IE5.